Social media, like everything, is in a constant state of flux, and so are the people who use it. As platforms evolve to expand their reach and serve the needs of users, the public across generations is choosing favorites, further shaping how we should be using social media for marketing. At our first quarter 2018 HubSpot User Group (HUG) event, one topic of discussion was Facebook, how ubiquitous it is and how popular, even in light of recent data-use revelations. But no sooner was that thought uttered than a young college freshman in attendance spoke up to say that she and her peers don’t use Facebook much anymore, preferring Snapchat and Instagram instead. While that’s just one young person’s observation, a recent Pew Research Center study provides a national look that isn’t too far off. 1) With YouTube dominating at 73% usage by Americans, Facebook took second with about 68% of U.S. adults reporting use and approximately 75% of those using it daily. Considering all social media platforms, among those 18 to 29 years of age, 88% use “any” social media, a number that decreases as age increases, with those 30 to 49 years reporting 78% use, 50 to 64 years reporting 64% use, and 65 and older reporting just 37% use. 2) Young people ages 18 to 24 are the most voracious users of all social media platforms, with 94% using YouTube, 80% using Facebook, 78% using Snapchat (71% using it multiple times each day), 71% using Instagram, and about 45% using Twitter. So, while Facebook is still in use by this age group, other platforms are gaining ground. Also notable is that while Snapchat use is increasing in the 18- to 24-year-old group, the next age group, 25 to 29 years, reported Snapchat use at just 54%. 3) Despite anecdotal evidence that social media is somewhat addictive, the majority of Americans surveyed reported that they would not find it difficult to give it up. And, not too surprisingly, the percentage grows as age increases: 49% of those 18-24, 60% of those 25 to 29, 56% of those 30 to 49, and 66% of those 50 and above. However, since a similar survey in 2014, the number of Americans reporting that it would be hard for them to stop using social media rose 12 percentage points. 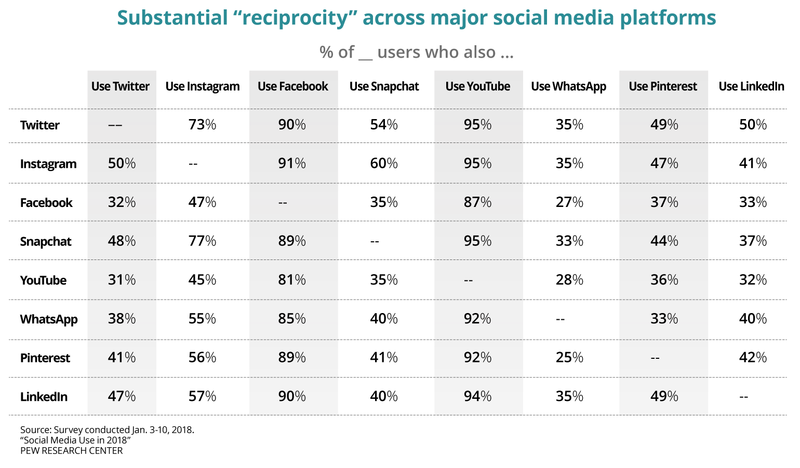 4) Among the eight social media platforms included, the study showed considerable usage “reciprocity” or overlap between them. Nationwide, 73% of Americans use more than one platform and the median use is three sites. Broken out by age group, the median 18- to 29-year-old uses four platforms, 30- to 49-year-olds use three platforms, 50- to 64-year-olds use two, and 65 and older use one. However, even with use at a steady rate, only about 3% of users surveyed said they had “a lot of trust” in the information found on the sites. 5) Overall, compared to the Pew Center’s 2016 survey of social media use, the numbers across all social media platforms are similar with one notable exception: Instagram use has increased seven percentage points from 28% to 35%. In addition, 81% of Instagram users in the 18 to 24 age group report visiting the platform at least daily, with 55% checking Instagram several times each day. Statistics like these demonstrate the importance of data as a factor in strategizing for different social platforms. As new generations enter our markets, we're going to have to keep a close watch and adjust accordingly. If you need some help keeping up, don't hesitate to reach out!